The purpose of this article is to provide instructions for removing My Security Shield, its Trojans and fake warning messages. These days, it seems that security programs for you computer are almost everywhere you turn, and for good reason. There are thousands of online pests waiting to infect an unprotected machine. Unfortunately, however, not all of these programs are quite as helpful as they seem, and My Security Shield is one of those that simply won't eliminate any of your online security concerns. My Security Shield is a rogue antispyware program. By using a number of tactics designed to frighten you into purchasing the full version of the program, lots of those who have this program on their machines end up purchasing software that simply doesn't have the necessary coding to remove any sort of threat to your computer. Most individuals end up with My Security Shield on their computers thanks to a Trojan. In most cases, a security scan will pop up while you're online, and even clicking to close it allows it to sneak onto your computer. This program is considered to be a clone of a similar rogue antispyware application called Virus Doctor, Security Master AV, and My Security Engine. In fact, many people may notice that they have many of these programs installed at the same time on their computers. Even if you do have antivirus software on your machine, you likely aren't protected from My Security Shield or programs like it. These aren't actually viruses, so the definitions files that most antivirus programs work from don't include the necessary information to eliminate rogue antispyware. As a result, there could still be security holes in your computer, even with the best antivirus programs. If you do have this program installed on your machine, there are a number of different things you're going to notice immediately to help you decide whether or not to remove it right away. If you see this error again, operational information can be irrevocably lost. the address space of your Operating System. Warning! Your computer is at risk of malware attacks. Description: This is a VBScript-virus. It steals user's passwords. 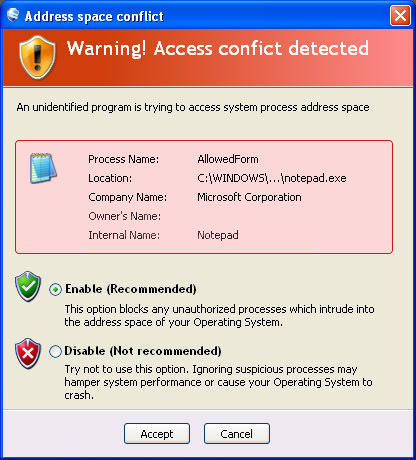 In addition to those messages, you may also see a malware scanner pop up during the course of your day. Keep in mind that this is designed to look like real security software, but the product can't actually help you. The scanner vaguely resembles popular pre-installed Windows Defender program. After it's completed a scan, it will tell you that your system has not been cleaned, at it will not only let you know how many total threats it found, but it will also alert you with the names of those threats. It has preinstalled a number of different files so that it can "find" them during the scan for malware on your machine, and in most cases, you don't actually even have the full files on your computer. You are then given the option of whether you want to "Remove All" of the threats. Clicking on it or a box like Activate Ultimate Protection in the top left corner of the window leads you back to the home page for My Security Shield where you are prompted to purchase the full version of the program. If you're fairly advanced in terms of handling the security of your computer, you can engage in manual removal processes. This does involve both editing your computer's registry and eliminating computer program files to fully remove My Security Shield. Keep in mind that both of these actions, if performed incorrectly, could have damaging repercussions on your system as a whole, so they should only be performed by computer experts. A list of files and registry keys to delete does appear after this article if you choose to handle the process on your own. The far better way to remove the program is to choose the best antispyware software application you can find. Remember to do your research before you download anything else, as there are some other rogue antispyware programs posing as great security helpers that will only put your computer at greater risk. One good choice is Anti-Malware 2.0. Once you choose a program that works for you, install it, update it, and allow it to run a full scan of your system. It will automatically detect and remove My Security Shield. If you update it regularly, it can help keep your machine safe from other similar programs in the future too. If My Security Shield has blocked your system in anyway, start your system in safe mode. Access that by hitting F8 continuously during startup. Scan your system with Anti-Malware 2.0 deleting all detected infections. My Security Shield doesn't have to cause your computer ongoing problems. Remove it immediately, install a solid security software suite, and you'll stay safe from other pests in the future. If you have any questions or need more help uninstalling My Security Shield please feel free to contact us. If this information was useful to you please Like us by clicking the social media button on this page. The owner of this website is NOT affiliated with and does NOT endorse My Security Shield, mysecurityshield or any other malicious program.